Whether you are in line for a new product launch or camping in the woods, sometimes you just need a bed. So to help you in such scenarios and save you from lying down on the cold hard ground, a company has designed a wearable futon that can be easily carried around. The coat like bed contains padding so that one can easily rest on the floor and it can also be rolled up into a sleeping bag. 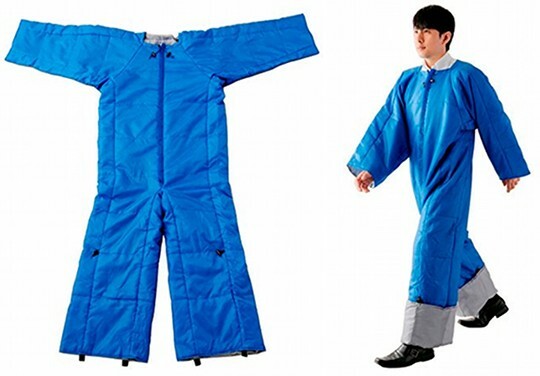 This wearable Futon Air Mat Set was created by a Tokyo-based Japanese office supply manufacturer King Jim. It can be tied around the neck and the bottoms of the legs fold up to adjust for different heights. You can also change the fit of the ‘coat’ depending on the temperature. The package includes an air mat to provide a full blanket and futon set so the user won’t have to sleep on the ground on the futon only. The main coat-futon can be rolled up into a sack like a sleeping bag and the air mat can be easily folded into a compact A4-sized bag. The sleeved and legs in coat mode can also be folded up for ease and comfort. The product is made of nylon, polyethylene and polyester. The weight of the coat is about 1.5lbs (700g), which makes it easy for most to wear and carry. In size it measures 5.25ft (1.6 meters) long and two feet (0.6 meters) wide, while the air mat measures 9.45ft (2.88 meters) long and 2.3 ft. (0.7 meters) wide. 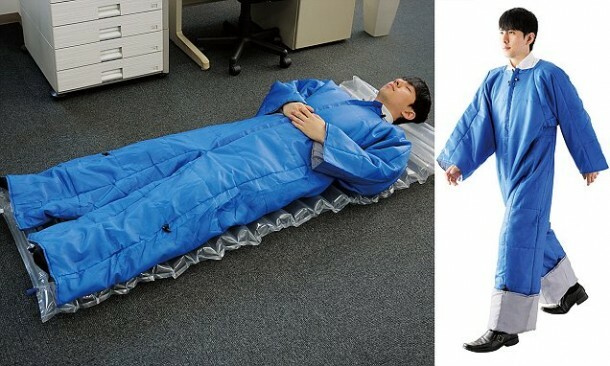 That is comfortable enough for most people, but if you want to share it with someone, they have to get their own Wearable Futon Air Mat Set. The mat can load up to 440lbs (220kg) without breaking. The product is up for sale for about £25 ($40) from supplier King Jim, but there’s no news of a release in other territories yet.